This is the best asparagus frittata ever if I do say so myself. It’s savory, cheesy, and perfect for a spring brunch. Grab the recipe and pull out your cast iron. Breakfast is coming! Preheat your oven to 375° F. In a 10 inch, oven proof skillet, heat oil over medium heat. Add ham and scallions and sauté until scallions are wilted and ham takes on some brown color, about 5 minutes. In a large bowl whisk the eggs until the whites and yolks are thoroughly combined. Add the salt, pepper, ricotta and cheddar cheese, and whisk to combine. 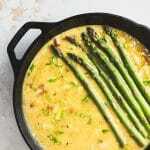 Pour the egg mixture evenly over the ham and arrange asparagus over the top of the egg mixture. The egg will puff up around the asparagus, so it’s ok if the asparagus sticks up a little bit. Transfer to the middle rack of your oven and bake for 20-25 minutes, or until the top is golden and puffed and the tip of a knife inserted into the center comes out clean. Let cool for 5 to 10 minutes and serve. If you want to make this a little richer (although it’s plenty rich with the cheese) you can add 2 tablespoons of half and half or heavy cream. It’s totally not necessary but very good. This can be served hot or room temperature. If you’re worried about sticking, just coat your pan with a little nonstick spray before beginning the recipe. But if you have a decently seasoned cast iron pan, then you should be fine.